Make addition fun with this engaging game! This hands on activity reinforces the skills of adding numbers through an extended algorithm of partial sums while reviewing making comparisons. The game was designed in collaboration with two second graders themselves. 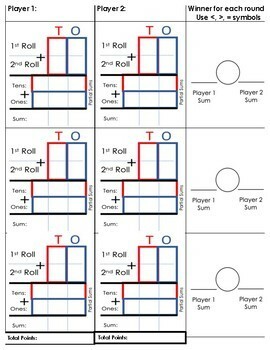 The idea is for each player to simply roll 2 dice two times, recording the digits in the addition chart. Each player's goal is to obtain the greatest sum. Lastly, at the end, the children tally up the greatest sums to determine the winner! This game includes a learning objective, addressed standards, and clear instructions. All that is needed is dice! 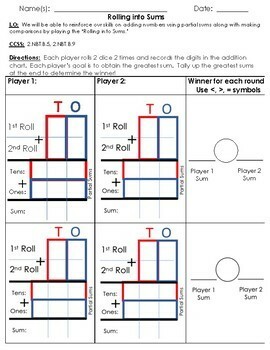 Feel free to laminate this game to keep it in a math center for a great go to activity! To note: 2 exemplars are included along with an enlarged template for modeling!